Bipolar awareness, love from a mother. This will be short. Because for those suffering today is just another day of battle and unknowns. This illness is not one prone to going away, there is no cure. I know that I don’t live with bipolar, but having a young son who fights every single day, it has taught me more than I thought possible. I urge you to read previous posts on this blog, I urge you to open your mind and heart, and simply understand this illness is not one of ease, that these individuals suffering are not less than us, they are not ill for your humour. I ask that you simply, and quite easily break down the stigma and stereotypes that so many seem to accept and tolerate in regards to bipolar. 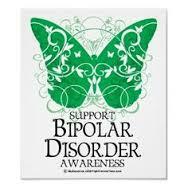 You must understand bipolar is like a snowflake, each one is different, which makes treatment that much more difficult. I ask that you refuse to tolerate jokes, jabs and cartoons at bipolars expense. I ask that you think long and hard about how you would feel if you, your child, your spouse or parent fought hard every day to stay here with you, and that yes sadly sometimes they succumb to the illness but until you walk the road don’t you dare say that they’ve chosen it. 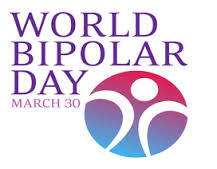 I ask that as you wouldn’t scoff at treatment of cancer or heart disease you don’t scoff at that of bipolar. I ask that you open your eyes and accept and understand this is a real, life or death, chronic illness. I ask that even if you don’t understand it, you don’t judge it. And if you are suffering, I ask that you trust that you are loved, valued and appreciated. 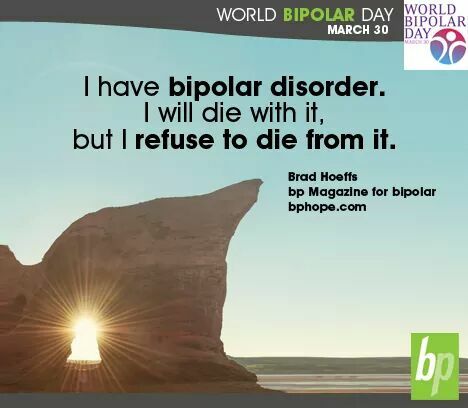 You may have bipolar but bipolar isn’t who you are! You are so so much more! You are talented, and kind. You are stronger than most, and courageous beyond measure. You are you. And that is enough! Don’t let close mindedness and ignorance determine who you are. You are as good as anyone else walking, and better than some,but definitely not less because of your illness. Be proud, and be strong. Be yourself and hold your head high. You are loved, and those who don’t get it don’t matter. During this transition I’ve realized a few things. And remembered a few more. When dealing with more than one (chronic) illness or disorder we pick the biggest /worst /most impacting one of the moment, and tend to let the others slide a bit, forgetting that all are a piece of the puzzle. Dude doesn’t just have a rapid cycling bipolar diagnosis, but has developmental coordination disorder – mild brain damage, sensory processing disorder, OCD, severe anxiety and panic disorders. For years we shuttled him twice weekly to physio, OT, doctors and therapists. But as with almost all chronic illness there comes a point where you hit the maintenance part. Where they’ve taught you and helped all they can and so you just figure it out and live with it. And when you live it every day it just becomes, until you don’t really think about it until crisis or flare up or new information arises. Some of those puzzle pieces get lost, but the main ones remain because they are the biggest pieces of the puzzle, in our case bipolar was and is the biggest piece of the puzzle, but the other pieces complete the picture. Forever we’ve known that Dude becomes exhausted both mentally and physically quicker and more severe than his peers. We tried shortening his days and weeks as the school year went on and it was becoming harder and harder for him to get there and triggers were making life literally a hell for him. See he starts school off fantastic, by December it’s a struggle, but by February it’s damn near impossible to get him out the door without rapid cycles and debilitating panic attacks. No amount of shorter days or weeks were helping. Nothing he tried to cope was easing the overwhelming fears. DCD amplifies his exhaustion and frustration, and SPD makes it incredibly hard to handle the noises, lights and people. School is tough for any teenager, it’s down right painful for him. By mid year his mind and body are so fatigued that the thought of leaving the house alone is exhausting. So now we are here working with the school to shorten his year. And we realize that it’s not only the biggest puzzle piece, but the whole puzzle that make up the reasons for school being such an incredible stressor, no matter how excellent the school, for him. In having made this transition, it’s brought me back to the little pieces and how they all fit together in my child’s brain, how they all play a role and how we need to adjust at any given moment depending on which pieces are showing or missing or are mixed up . As a parent when your child is ill, you search long and hard to find those missing puzzle pieces. You move heaven and earth to fit them all together! And there’s nothing like the relief of finally having them all in place. There’s also nothing more frustrating than knowing even with all the pieces, there’s no cure,for any of them. 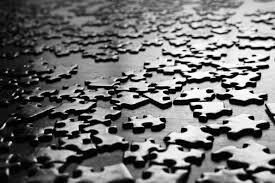 Those puzzle pieces sometimes confuse me, frustrate me, hurt and leave me lost. Sometimes we choose the wrong piece and have to spend hours upon hours trying to find the right spot. Or we have a spot the piece just won’t fit. And we just keep trying! Because when the puzzle is complete and sitting perfectly just as it should before a piece of the puzzle jumps off the table again, right then the puzzle is beautiful! There’s one thing I’ve never, nor will ever understand. 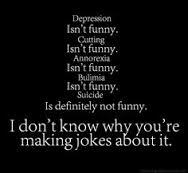 And that’s finding humour in others pain, illnesses or struggles. Our world is so full of humour, if you choose to see it. Laugh at things circumstances, hell even yourself. But don’t laugh at others, or stereotypes of others. I will not carry others ignorance, stigmas and judgements. I refuse to allow them to drain me of the fight I fight. But it still angers, hurts and frustrates me. I will always advocate for the underdog, especially the underdog that is mental illness. I will continue to chip away the little pieces of the stigma I can, in hopes one day my child will not be laughed at because of the stereotypes surrounding his illness. So many that are so inaccurate it’s ridiculous. Yesterday I found myself flicking onto social media, and my feed was full of the “you’re in a mental hospital” joke. You know the one that tags your friends, ones running naked, ones licking windows, ones rocking in a corner, ones in a straight jacket and so on. I am not sure my blood pressure has spiked that high in quite some time. Are you kidding? And don’t for a second say I’m over reacting, I bit my tongue, but I’m allowed to share just how inappropriate things like this are, and why. And so I will. I am a mother, a mother to a child who has indeed been hospitalized. Would it be appropriate to share a similar “joke” about a cancer ward? A cardiology ward? A palliative ward? No. Every single person I know would say that is not appropriate. Being on one of those wards isn’t funny. And they’d be right. It’s not. We don’t make jokes and fill up the Internet with jokes of iv bags, hospitals and chemo. So why, why do we think it’s appropriate to do so for mental illness? Especially using derogatory, out of date stereotypes? So we can make light of people who actually need these facilities, to save their lives? So they are made to feel inferior, and less than you because they have an illness? That’s exactly how you’re making their feel. People with mental illness are not a joke. They are not suffering for your pleasure. Second. Go visit a psychiatric hospital. Do it. If you think it’s funny or this is what you see there. Heck take your child, try leaving them there without you for a period of time, and try to laugh about it. Hilarious right? Ya that’s what I thought. First you will find its not a place like the 50s movies portray. Second you’ll notice, yes there may be some restraining, but do you know why? Because that patient just tried slitting their wrists, or jumping to their untimely death. Or are lost and confused and scared to death. You will not see patients running naked, etc. You will see pain and hurt, and hear heart wrenching stories. You will see very young patients, middle aged mothers, grandfather’s and everything in between. And I promise you won’t walk out the locked doors laughing. And if you do, I’m sorry your the one with the problem. I know many that mean nothing by sharing the “crazy” jokes, I know many that mean no harm. But you are. You are flaming stereotypes that many are trying desperately to put out. I know it’s all meant in good humour, but it’s not good humour. It’s hurtful, derogatory humour, that so many assume does no harm. You’d be wrong. I may not be able to control others, I may not be able to change the world. But I can change who I allow in mine, and I will not continue to shrug it off. I will however continue to love my loved ones the best way I can. And one of those ways is not laughing at their pain, and by using my voice and heart to fight for them and others to scared to speak up. I may not be able to control these kinds of things, but I damn well won’t tolerate them either. In life we wonder. A lot. Question ourselves. All the time. Constantly trying to get to the bottom of things, figure things out . Lots of things. We have to believe and hope. Belief and hope is all we get. We wonder and we doubt. And doubt and wonder we will. it’s that belief and hope that will eventually get that wonder to settle and the doubt subside. we’ll be hopeful and believe. We’ll hope for the best and believe it is or will be. Believe and hope we will, because in life that is all we have. You are currently browsing the Bestkids's Blog blog archives for March, 2015.